"Bishop of the Marthama, and Bishop of the Jacobite Christians, in Travancore." [English: Bishop of the Marthama, and Bishop of the Jacobite Christians, in Travancore.]" "[original caption] Bischoff der Marthama & Bischoff der Jacubite-Christen in Travancore." [Original text]: "1) Der auf der rechten Seite ist der Jacubite-Bischoff & 2) links mit der Brille ist der Bischoff der Marthama-Christen." [Stamps]: "Amateur Work Executed by Wiele & Klein, Mount Road, Madras." Title: "Bishop of the Marthama, and Bishop of the Jacobite Christians, in Travancore." 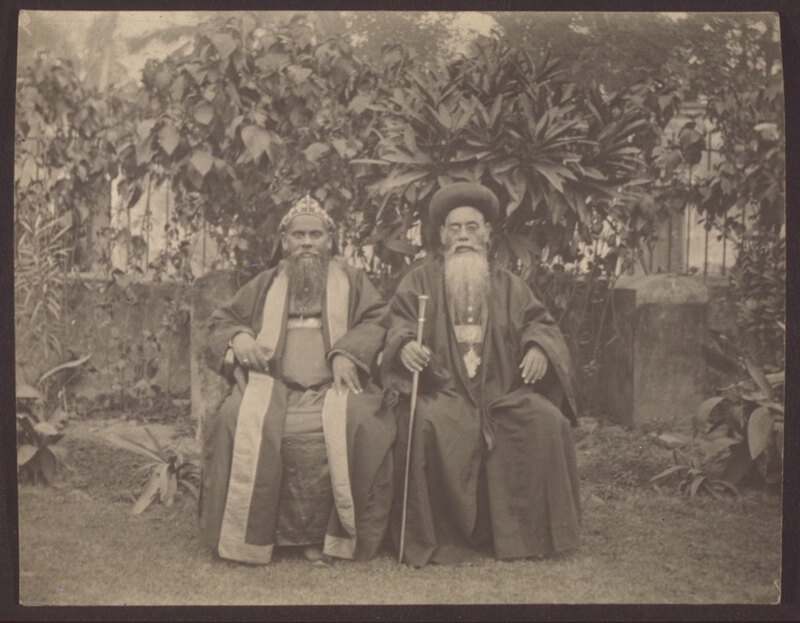 Wiele & Klein, %Madras; %Bangalore, %%India , “Bishop of the Marthama, and Bishop of the Jacobite Christians, in Travancore.,” BMArchives, accessed April 19, 2019, http://www.bmarchives.org/items/show/66631.